The reason we, as humans, become embarrassed is because we feel a failure to meet certain social standards. Often, this embarrassment comes in the form of actions – such as when we accidentally don’t do what is expected for particular situations. Sometimes, the embarrassment isn’t based on what we do, but rather on how we appear. A great example of this is showing up to a party either over or underdressed. Another example—one we can help you overcome—is when you’ve developed a case of fungal toenails. Now, this condition is certainly embarrassing and can have adverse effects on emotional and social health (more on this in a second), but it can also affect your physical health. The emotional and social components of toenail fungus stem from the embarrassing appearance of nails that have become discolored and distorted. This creates a situation wherein you feel highly self-conscious when your feet are bare, potentially to the point that you don’t wear sandals or open-toed shoes and refrain from social activities like going to the beach with friends. That is certainly reason enough to have a case of fungal toenails treated, but there are also considerations for your physical health as well. As a starting point in this regard, the simple fact is that fungal infections can spread. If you have one toenail that has become infected, the ones around it are at risk as well. More than transferring the infection from nail to nail(s), the fungus can cause athlete’s foot. As far as foot problems go, athlete’s foot isn’t normally too serious. That said, it causes itching, burning sensations and, as we’ll discuss, can also be problematic for those who have diabetes and other diseases affecting the immune system. Fortunately, most cases of athlete’s foot are effectively resolved with off-the-shelf antifungal products (when used in accordance with labeled instructions). If you have a case that’s more severe in nature, however, don’t hesitate to contact our Palm Desert office and we can prescribe stronger medication to treat it for you. Beyond spreading in the form of athlete’s foot, toenail fungus can actually lead to jock itch. This fungal infection will usually happen when underwear is pulled over infected nails as it’s being put on, and fungal spores latch onto the fabric before transferring to private regions. If you have fungal toenails and want to prevent that from happening, the easy fix is to simply put your socks on before your underwear. In addition to causing discoloration and dullness, this fungal infection can cause toenails to become thickened and misshapen. When this happens, it can potentially lead to—or exacerbate—an ingrown nail condition. Further, it might cause pain and make walking difficult (especially when wearing shoes). Of course, you won’t likely have that pain if the condition has caused you to lose infected nails (as it sometimes happens). When the fungus causes a toenail to separate from its respective nailbed—which is known as onycholysis—the nail may eventually rip off. When we look at how fungal toenails affect your health, the most concerning issues are when other problems exist. In particular, nail fungus is especially dangerous for those who have diabetes, HIV/AIDs, and other conditions that compromise the immune system. A couple dangers of diabetes are reduced blood flow and impaired immune systems. Systemic damage like these make the body less efficient at fighting off infections. Accordingly, more than one out of every five diabetic individuals have fungal toenails. As with diabetes, HIV and AIDs give individuals greater risk for fungal infections like this one. Dry, cracked skin can allow bacteria to enter the body and lead to cellulitis – a condition that causes skin to become red, tender, and swollen. In severe cases, the infection enters the bloodstream. This is potentially a life-threatening situation. Cellulitis must be treated with antibiotics. A better practice, though, is avoiding the situation from developing in the first place. And this means having your fungal toenails treated as soon as possible! Clearly, there are several reasons why you should have toenail fungus treated. Sure, there are “quality of life” concerns stemming from embarrassment and self-consciousness. Perhaps more importantly is to avoid your risk for other physical health problems. When it comes to fungal toenail treatment, something you need to keep in mind is this – the condition is treatable, but it won’t go away on its own. After all, why would it? Fungus needs a warm, damp environment to survive, and feet provide that (especially when encased in socks and shoes). This is a stubborn infection, but technology has given us a great tool for addressing it – laser therapy. In the past, the gold standard for fungal toenail treatment was to use both topical and oral medications. The two-pronged approach served to capitalize on the respective strengths—while minimizing the weaknesses—of both forms of medication. Topical medication treats the infection from the outside, but cannot reach fungal spores residing underneath the nail and on the surface of the nailbed. Oral medications travel through the bloodstream and can hit those hard-to-reach spores, but can come with undesirable side effects. Laser treatment for fungal toenails is the best of both worlds. How so? Well, because the laser can actually travel through the nail tissue to target spores topical medications cannot reach. At the same time, there are no side effects. Even better, fungal toenail laser therapy is effective and incredibly easy. You simply come in for a quick session (less than half an hour) and then can walk out and go about your normal activities. It’s important to keep in mind that the process does start working immediately, but you won’t see result for a couple of months. The reason for this is simply the fact it takes time for your new, healthy nail tissue to grow. 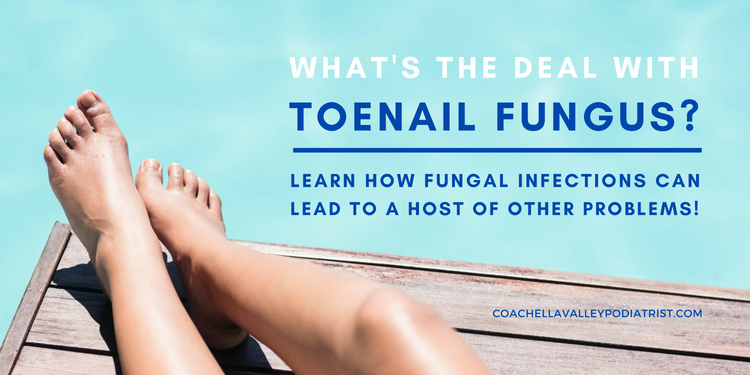 For more information about laser treatment for fungal toenails—or to request an appointment with our Coachella Valley office—simply give us a call at (760) 568 – 0108 or connect with us online today.